Nearest: Tube Station: Tottenham Court Road 140 yards (128 metres), Railway Station: London Charing Cross 0.7 miles (1.1 km), DLR Station: Tower Gateway 2.4 miles (3.9 km), Motorway: M1 Junction 1 5.7 miles (9.2 km). This hotel boasts 7 tube stations with a half mile radius (0.8 km). 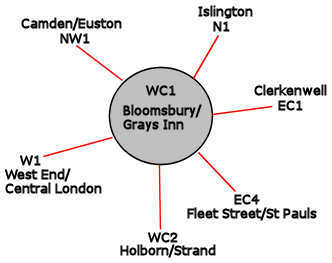 The Bloomsbury Hotel is in a great location on the doorstep to London's west end and theatreland. Just yards from the endless electronic bargain shops along Tottenham Court Road, from the busiest shopping high street in Europe along Oxford Street and from the wonderful nightlife of Covent Garden. Also a short stroll from Soho which is known for its adult geared bars and clubs (including strip clubs) and its many excellent restaurants. Covent Garden and Soho are major parts of theatreland and there are 9 theatres within 1/3 of a mile of the hotel. The Jurys actually sits opposite one of London's major attractions, the British Museum . All-in-all this location allows for easy access (much of it walking distance) to central London and many of the best known attractions. Piccadilly Circus which marks the very centre of tourist London is just half a mile to the south. Local places of interest include Ben Uri Art Society and London Jewish Museum of Art (0.2 miles), Curzon Soho Arthouse Cinema (0.3 miles), Pollocks Toy Museum (0.3 miles), London Transport Museum (0.5 miles), Leicester Square (0.5 miles), Sir John Soames Museum (0.5 miles), Petrie Egyptian Archaeology Museum (0.5 miles) and Ripley's Believe it or Not Museum (0.5 miles). Within an area known as Bloomsbury from where the hotel takes it name, The Bloomsbury Hotel London is a neo-Georgian originally designed for the YWCA by architect Sir Edwin Landseer Lutyens. All rooms are air-conditioned (climate control), are en-suite (power shower, Temple Spa amenities) and have duck down duvets and free broadband internet access. In-room amenities include direct dial telephone with voicemail, cable television, Work desk/Lamp, Radio, Alarm Clock, Trouser Press, Hairdryer, Iron and Ironing Board, Minibar, Tea/coffee Tray and In-Room Safe to fit laptop. Classic Rooms are modern but with original details. Deluxe Rooms come with an evening newspaper, bathrobe, mineral water and Nespresso coffee maker. Junior Suites have a separate lounge area and separate bath and shower. Landseer British Kitchen Restaurant: Offers traditional elegance and classic and modern British cuisine using fresh ingredients from the UK. Example dishes: Hebridean scallops, Gressingham duck, Black Mountain Welsh Valley lamb and Perthshire steak. Lanseer Bar: Club-like bar with original rich wooden panels and relaxed atmosphere offers a welcome retreat at the end of the day. Wine by the glass, Champagnes and coctails. The Lounge: Elegant Lounge with Lutyens style furnishing offering beverages and snacks throughout the day. The lounge is furnished with comfortable sofas and contemporary armchairs. Traditional Afternoon Tea is served in the lounge. On-site amenities include a Laundry/Dry Cleaning, Concierge, Business Centre, Currency Exchange, Hairdresser, Conference & Banqueting Facilities for up to 350 people and 7 Dedicated Meeting Rooms. Marylebone Hotel: is 0.9 miles (1.4 km) away, has a guest satisfaction score of 89% and rates start from about £178. The Kensington London: is 2.7 miles (4.3 km) from here, earns a customer rating of 90% and base rates begin at about £198. Doyle Hotels have an average guest rating of 89%. The Bloomsbury Hotel with its rating of 90% is therefore not just well above average for this chain but is our highest rated Doyle hotel. Milesfaster ranking: 52nd from 866 London hotels, 1st of 3 Doyle Hotels, and 19th of 328 four star rated hotels. We can also suggest a cheaper options nearby which would be the Chamberlain Hotel. 0.1 miles from here (0.2 km), has scored 91% from former guests and has rates from around £87 (theres free WiFi too). The closest fifty hotels around this area (16-22 Great Russell Street, WC1 postcode) that are listed on this website cover a 0.5 miles (0.8 km) radius. The numbers for each star rating are 11 five star hotels (average rating 90%), 24 four star hotels (average rating 85%), 13 three star hotels (average rating 78%), 1 two star hotel (rated 80%) and 1 one star hotel (rated 45%). The highest rating in the area goes to Covent Garden Hotel (5 star), the Montague On The Gardens Hotel (4 star) and also the Soho Hotel (5 star) (all joint top with 99%). Base Rates: We look at what the average base rates are for the area and by star rating. These rates do not take account of offers and short term deals so are just a guide. If we look at the average for all hotels in the area (nearest 50) we get an average base rate of £147 per night. The lowest rates are at £18 at SoHostel (2 Star, 80%) and highest base rates of £378 at Ham Yard Hotel (5 Star, 91%). Averages for each sector of star rating: Five Star average: £276, Four Star average: £129, Three Star average: £89, Two Star average: £18 and One Star average: £55. We rank hotels based on our own proprietary algorithm based mainly on guest ratings but adjusted for influencing factors. We rank Bloomsbury Hotel 12th (joint) of the 50 local hotels and 6th (joint) for the 24 four star hotels in the area. The hotel is 37th of 50 (21st of 24 four star hotels.) for lowest standard rates locally. Looking at the hotels rates plus its user rating we rank it 24th of 45 for sheer bang for buck (SoHostel was top). comment: Was called the Jurys Great Russell Street until 2009.